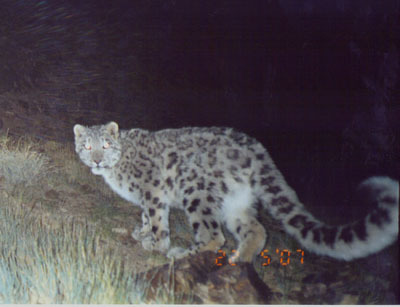 The Snow Leopard Conservancy’s program in this important range country was initiated in 2007. Dr. B. Munkhtsog, who directs the NGO Irbis Mongolia and serves as Senior Scientist with the Mongolian Academy of Sciences, asked Rodney Jackson and Dr. Jan Janecka of Texas A&M University to train Mongolian biologists in camera trapping and in noninvasive genotyping of scats. This proved to be the beginning of our multi-nation applied genetics program described in the section on monitoring of snow leopards. The above paper was the Associate Editor’s Choice for papers published in 2010 in Animal Conservation, the Journal of the Zoological Society London. You can read the journal article. 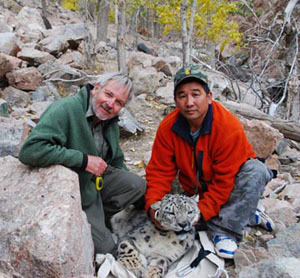 In late September, 2008, in a canyon of the isolated Baga Bogd Mountain, we attached a Northstar GPS collar to an adult male snow leopard. The team named him Togoldor, meaning very great, amazing, incredible. The collar transmitted 1,080 GPS locations over the year Togoldor wore it before it automatically fell off, as programmed. This animation tracks Togoldor’s movements as he travels around his home range over a 12 month period. On average, he moved about 28 miles (45 km) per week, including stationary time spent resting or at a kill, covering his home range of up to 260 square miles (670 sq. km.) We concluded that Togoldor was the dominant resident male on the mountain. While he regularly crissed-crossed his entire home area, Togoldor seemed to prefer the northern slopes of Baga Bogd Mountain, which has fewer herders than the southern slopes (the upper portions of the screen, as we are looking to the south). We believe that he made a large kill every 10-21 days; these are indicated by the red dots. Again, such sites are clumped in selected parts of the mountain which we believe support more ibex, the primary large prey of snow leopards in Mongolia. Togoldor showed a strong preference for the northern edge of Baga Bogd, where the human population is lowest. As expected, he preferred areas of broken rocky terrain, interspersed with small grassy meadows favored by ibex. We detected 28 sites where we suspected he made a kill and fed over the next few days. We were surprised that Togoldor never left Baga Bogd; this fact reinforces how vital it is to protect these isolated mountains that link snow leopards between the South Gobi and core habitat elsewhere in Mongolia. Thus, we are expanding our genetic surveys to help identify and map the main breeding populations linking the South Gobi with Russia’s Altai-Sayan mountains. We believe that conservation efforts targeting the border area will promote recovery of the depleted Russian snow leopard population. In addition to the Mongolian study, a multinational team is examining the genetic diversity of snow leopards in Russia, Pakistan, China, Nepal, and Tajikistan.